Safety LMS, a tower construction safety training company headquartered in Austin, Tex., has announced it has expanded its capabilities with a new leadership team and additional locations for training. John Paul (JP) Jones (left) has taken over as President of Safety LMS, and Jimmy Hurt has been appointed Vice President and Director of Business Development. Under new ownership, 39-year tower industry safety expert John Paul (JP) Jones has taken over as President of Safety LMS with 25-year industry veteran Jimmy Hurt as Vice President and Director of Business Development. Stephen Phillips continues to lead the company’s core group of instructors with Jo Anna Ivey serving as training coordinator and administrator. Additionally, Kwame Larnyoh continues Safety LMS’s training in Ghana, West Africa. Former co-founder Gordon Lyman played a pivotal role in the company’s success and still serves as a consultant, said Jones. “Gordon has been committed to climber safety for over 40 years and he has been a driving force in creating safety standards and developing Safety LMS to its highly recognized status as a premiere training company,” said Jones. Unique to Safety LMS is that they only employ telecommunications tower industry professionals as instructors and the current team has over 120 years of combined experience in all aspects of tower erection, modification, maintenance and antenna installation. Safety LMS is working on plans for a state-of-the-art training facility to be located in Austin. The facility, entitled VISTA (The Vertical Institute for Safety, Training and Aptitude) will have a 50’ guyed tower and two 50’ self-supporting towers under one roof along with three classrooms and offices. “All of our instructors have decades of experience. That’s what sets us apart. We are tower guys teaching tower guys. When someone is being taught the science of developing a rigging plan for a gin pole lift they want to know the person teaching him knows what he is talking about and has done it before many times. You can’t fake that kind of experience,” said Jones. 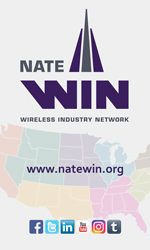 The Safety LMS leadership team is heavily involved in the National Wireless Safety Alliance (NWSA), National Association of Tower Erectors (NATE), Telecommunications Industry Association (TIA) and standards writing entities for the ANSI 10.48 standard for the Installation, Maintenance, Modification and demolition of telecommunications structures in the U.S.
Jones was recently re-elected to the Board of Directors of NATE. Safety LMS now has eight training centers complete with training towers strategically located around the nation and will also expand its open enrollment classes to all regions in the country. The company offers hands-on courses in the following subjects: Authorized Climber/Rescuer, Competent Climber/Rescuer, Hazard Awareness for Telecom sites, RF/EME Radiation, Basic Rigging Principles, Competent Rigger TIA 1019A, Gin Pole Theory and Operations, Tower Erection Hoist Operations, Capstan Hoist Safety & Operations, Crane Spotter & Signal Person, OSHA 10 Hour, OSHA 30 Hour, Helicopter Sling Load Operations, Non-Climber for PM/CM, Tower Inspection per TIA, Intro to Wireless Technology, LTE Technology, Lightning and Grounding & Exothermic Welding and Aerial Lift operation & Safety. Guyed tower plumb and tensioning training is under development. Safety LMS is also developing a series of educational videos; both should be released early 2016. Safety LMS is proud to be the exclusive training provider for the Warriors4Wireless program and has partnered with W4W and Texas A&M Engineering Extension Services, to launch a ground breaking Tower Technician Certification Course that trains and certifies the nation’s transitioning military personnel. For more info visit the Safety LMS website at www.safetylms.com or contact Hurt at jhurt@safetylms.com or call 512-710-5000.